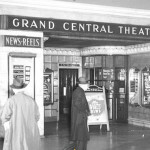 Did You Know There Was a Movie Theatre in Grand Central for 30 Years? 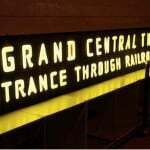 Grand Central Terminal is one of New York City’s most beloved landmarks, and over the years this historic transportation hub has stood the test of time. While the majority of the structure has remained intact, the businesses inside the station have seen their fair share of changes since first opening in 1871. 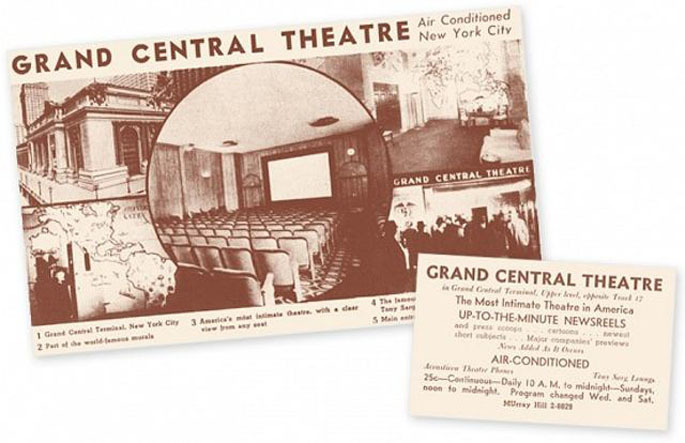 But one of the station’s more notable and less widely known tenants includes a special movie theatre designed specifically for travelers. 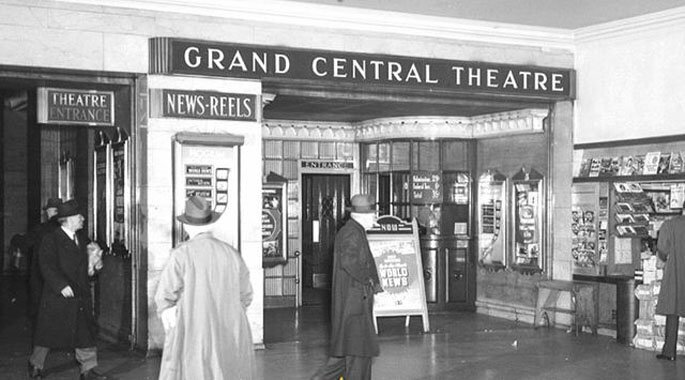 The Grand Central Theatre first opened in 1937, and showed short films curated specifically for commuters including news reels, documentaries and cartoons. 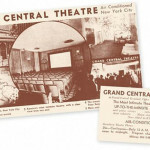 The theatre housed approximately 242 seats and operated for three decades before being gutted and replaced by a retail location. It is now home to the Grande Harvest Wine shop located next to Track 17. 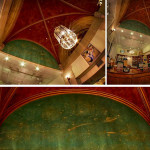 The space was also previously occupied by a photo shop. 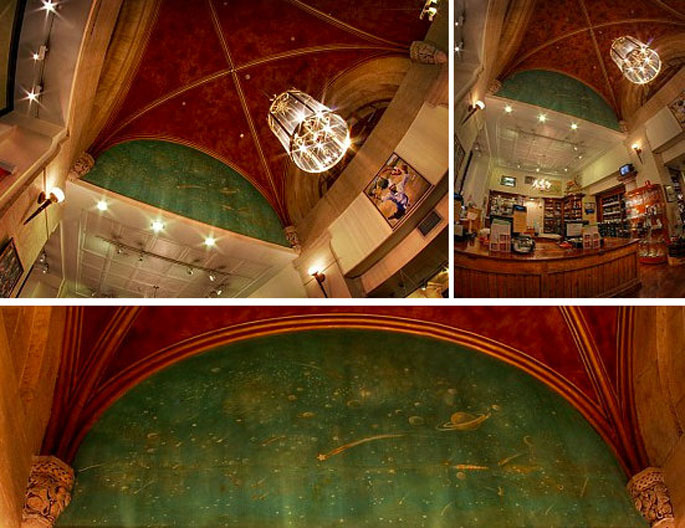 Renovations that took place in the 1990s revealed a ceiling mural similar to the one found in the main terminal. The mural was painted by artist Tony Sarg, who’s also responsible for designing the very first balloon ever to be included in Macy’s Thanksgiving Day parade. In addition to the starry adornments, Sarg also painted illustrated maps, that, according to the Times, had no political significance. 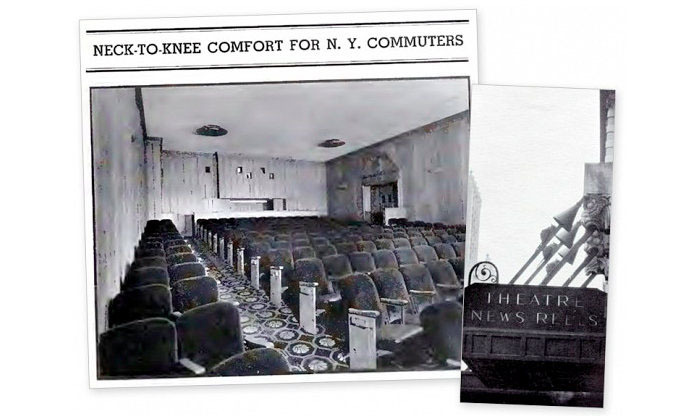 Installed inside the theater was an early version of stadium-style seating, as well as an illuminated clock that clearly displayed the time for busy travelers. 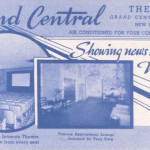 The rear of the theatre was kept clear to allow for standing room, and also had a small bar for patrons looking to wet their whistle while they waited. 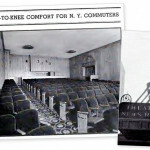 VIDEO: Why Did the Nazis Want to Destroy This Secret Power Substation Below Grand Central?